Leeds United’s hopes of signing Manchester United striker Ashley Fletcher have increased after the 20-year turned down the offer of a new contract at Old Trafford. Fletcher’s current deal with Manchester United is set to expire next week and his decision to reject an extension has cleared the way for a transfer to the Championship this summer. The YEP understands that Fletcher plans to start pre-season at Old Trafford while he weighs up his options but a departure from Old Trafford now appears likely with Leeds and other second-tier sides vying to sign him. Fletcher, who finished last season on loan at Barnsley, was watched by United owner Massimo Cellino during the League One play-off final at Wembley in May, a match in which the youngster scored the opening goal. Barnsley are one of the sides interested in taking Fletcher permanently and both Bristol City and Wolverhampton Wanderers have been linked with him in the past few days. 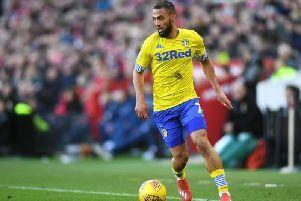 Leeds, however, are ready to meet his wage demands and are confident of tempting Fletcher to continue his career at Elland Road.